If the economy deteriorates in the L-shaped “hockey-stick” rut that many economists forecast, what political price will President Obama and the Democrats pay for having returned the financial keys to the Bush Republican appointees who gave away the store in the first place? Reappointing Federal Reserve Chairman Ben Bernanke may end up injuring not only the economy but also the Democratic Party for years to come. Recognizing this, Republicans made populist points by opposing his reappointment during the Senate confirmation hearings last Thursday, January 27 – the day after Mr. Obama’s State of the Union address. The hearings focused on the Fed’s role as Wall Street’s major lobbyist and deregulator. Despite the fact that its Charter starts off by directing it to promote full employment and stabilize prices, the Fed is anti-labor in practice. Alan Greenspan famously bragged that what has caused quiescence among labor union members when it comes to striking for higher wages – or even for better working conditions – is the fear of being fired and being unable to meet their mortgage and credit card payments. “One paycheck away from homelessness,” or a downgraded credit rating leading to soaring interest charges, has become a formula for labor management. Here’s the problem with that policy. Rising prices for housing have increased the cost of living and doing business, widening the excess of market price over socially necessary costs. In times past the government would have collected the rising location rent created by increasing prosperity and public investment in transportation and other infrastructure making specific sites more valuable. But in recent years taxes have been rolled back. Land sites still cost as much as ever, because their price is set by the market. Land itself has no cost of production. Locational value is created by society, and should be the natural tax base because a land tax does not increase the price of real estate; it lowers it by leaving less “free” rent to be paid to the banks. The problem is that what the tax collector relinquishes is now available to be paid to banks as interest. And prospective buyers bid against each other until the winner is whoever is first to pay the land’s location rent to the banks as interest. This tax shift – to the benefit of the bankers, not homeowners – has made Mr. Obama’s hope of doubling U.S. exports during the next five years ring hollow. This is the upshot of “creating wealth” in the form of a debt-leveraged real estate and stock market bubble. Labor must pay more for debt-financed housing and education, not to mention payments to health insurance oligopoly and higher sales and income taxes shifted off the shoulders of financial and real estate. Among Democrats running for re-election, Barbara Boxer of California pointed out that by spurring the asset-price inflation, the Fed’s pro-Bubble (that is, pro-debt policy) has crashed the economy, shrinking employment. The Fed is supposed to protect consumers, yet Mr. Bernanke is a vocal opponent of the Consumer Finance Products Agency, claiming that the deregulatory Fed alone should be the sole financial regulator – seemingly an oxymoron. How can the Fed be said to do this when the volume of debt is growing exponentially beyond the ability to pay? “Saving the debt” by bailing out creditors – by adding bad private-sector debts to the public sector’s balance sheet – is burdening the economy, not saving it. The policy only postpones the crisis while making the ultimate volume of debt that must be written off higher – and therefore more traumatic to write off, annulling a corresponding volume of savings on the other side of the balance sheet (because one party’s savings are another’s debts). 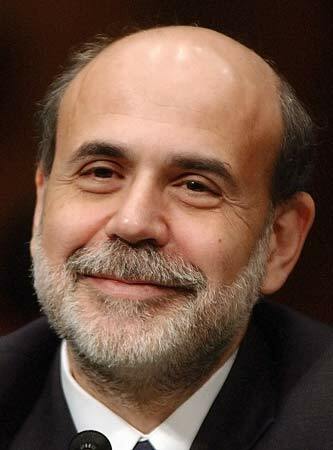 What really is at issue is the economic philosophy that Mr. Bernanke will apply during the coming four years. Unfortunately, Mr. Bernanke’s questioners failed to ask relevant questions along these policy lines and the economic theory or rationale underlying his basic approach. What needed to be addressed was not just his deregulatory stance in the face of the Bubble Economy and exploding consumer fraud, or even the mistakes he has made. Republican Sen. Jim Bunning elicited only smirks and pained looked as Mr. Bernanke rested his chin on his hand, as if to say, “I’m going to be patient and let you rant.” The other Senators were almost apologetic. One popular (and thoroughly misleading) description of Bernanke that has been cited ad nauseum to promote his reappointment is that he is an expert on the causes of the Great Depression. If you are going to create a new crash, it certainly helps to understand the last one. But economic historians who have compared Mr. Bernanke’s writings to actual history have found that it is precisely his misunderstanding of the Depression that is leading him tragically to repeat it. As a trickle-down apologist for high finance, Prof. Bernanke has drawn systematically wrong conclusions as to the causes of the Great Depression. The ideological prejudice behind his view is of course what got him his job in the first place, for as numerous observers have quipped, a precondition for being hired as Fed Chairman is that one does not understand how the financial system actually works. Instead of recognizing that deepening debt, low wages and the siphoning up of wealth to the top of the economic pyramid were primary causes of the Depression, Prof. Bernanke attributes the main problem simply to a lack of liquidity, causing low prices. As my Australian colleague Steve Keen recently has written in his Debtwatch No. 42 (http://www.debtdeflation.com/blogs/), the case against Mr. Bernanke should focus on his neoclassical approach that misses the fact that money is debt. He sees the financial problem as being too low a price level for assets to be collateralized for bank loans. And to Mr. Bernanke, “wealth” is synonymous with what banks will lend, under existing credit terms. In 1933, the economist Irving Fischer (mainly responsible for the “modern” monetarist tautology MV = PT) wrote a classic article, “The Debt-Deflation Theory of the Great Depression,” recanting the neoclassical view that had led him to lose his personal fortune in the 1929 stock market crash. He explained how the inability to pay debts was forcing bankruptcies, wiping out bank credit and spending power, shrinking markets and hence the incentive to invest and employ labor. Fisher’ s idea was less influential in academic circles, though, because of the counterargument that debt-deflation represented no more than a redistribution from one group (debtors) to another (creditors). Absent implausibly large differences in marginal spending propensities among the groups, it was suggested, pure redistributions should have no significant macroeconomic effects. All that a debt overhead does is transfer purchasing power from debtors to creditors. Bernanke is reminiscent here of Thomas Robert Malthus, whose Principles of Political Economy argued that landlords (Malthus’s own class) were necessary to maintain economic equilibrium in a way akin to trickle-down theorists through the ages. Where would English employment be, Malthus argued, without landlords spending their revenue on coachmen, fine clothes, butlers and servants? It was landlords spending their rental income (protected by England’s agricultural tariffs, the Corn Laws, until 1846) that kept buggy-makers and other suppliers working. And by the same logic, this is what wealthy Wall Street financiers do today with the money they make by lending to enable homeowners and savers to get rich making capital gains off asset-price inflation. The reality is that wealthy Wall Street financiers who make multi-million dollar salaries and bonuses spend their money on trophies: fine arts, luxury apartments or houses in gated communities, yachts, fancy handbags and high fashion, birthday parties with appearances by modish pop singers. (“I see the yachts of the stock brokers; but where are those of their clients?”) This is not the kind of spending that reflects the “real” economy’s production profile. Mr. Bernanke sees no problem, unless rich people spend less of their gains on consumer goods and the products of labor than average wage earners. But of course this propensity to consume is precisely the point John Maynard Keynes made in his General Theory (1936). The wealthier people become, the lower a proportion of their income they consume – and the more they save. This falling propensity to consume is what worried Keynes about the future. He imagined that as economies saved more as their income levels rose, they would spend less on goods and services. So output and employment would not be able to keep pace – unless the government stepped in to make up the gap. The problem is that workers and consumers have gone deeper and deeper into debt, saving less and less. This is just the opposite of what Keynes forecast. Only the wealthiest 10 percent or so of the population save more and more – mainly in the form of loans to the “bottom 90 percent.” Saving less, however, goes hand in hand with consuming less, because of the revenue that the financial sector drains out of the “real” economy’s circular flow (wage-earners spending their income to buy the goods they produce) as debt service. The financial sector is wrapped around the production-and-consumption economy. So an inability to consume is part and parcel of the debt problem. The basis of monetary policy throughout the world today therefore should be how to save economies from shrinking as a result of their exponentially growing debt overhead. Bernanke finds “declines in aggregate demand” to be the dominant factor in the Great Depression (p. ix, as cited by Steve Keen). This is true in any economic downturn. In his reading, however, debt seems not to have anything to do with falling spending on what labor produces. Taking a banker’s-eye view, he finds the most serious problem to be the demand for stocks and real estate. Mr. Bernanke promises not to let falling asset demand (and hence, falling asset prices) happen again. His antidote is to flood the economy with credit as he is now doing, emulating Alan Greenspan’s Bubble policy. The wealthiest 10 percent of the population do indeed save most of their money. They lend savings – and create new credit – to the bottom 90 percent, or gamble in derivatives or other zero-sum activities in which their gain (if indeed they make any) finds its counterpart in some other parties’ loss. The system is kept going not by government spending, Keynesian-style, but by new credit creation. That supports consumption, and indeed, lending against real estate, stocks and bonds enables borrowers to bid up their prices, enabling their owners to borrow yet more against these assets. The economy expands – until current revenue no longer covers the debt’s carrying charges. That’s what brings the Bubble Economy down with a crash. Asset-price inflation gives way to crashing prices and negative equity for real estate and for much financial debt leveraging as well. It is in this sense that Prof. Bernanke’s blames the Depression on lower prices. When prices for real estate or other collateral plunge, it no longer can be pledged for more loans to keep the circular flow of lending and debt repayment in motion. This circular financial flow is quite different from the circular flow that Keynes (and Say’s Law) discussed – the circulation where workers and their employers spent their wages and profits on consumer goods and investment goods. The financial circular flow is between the banks and their clients. And this circular flow swells as it diverts more and more spending from the “real” economy’s circular flow between income and spending. Finance capital expands relative to industrial capital. Higher prices in the “real” economy may help maintain the circular financial flow, by giving borrowers more current income to pay their mortgages, student loans and other debts. Mr. Bernanke accordingly sees FDR’s devaluation of the dollar as helping reflate prices. Today, however, a declining dollar would make imports (including raw materials as well as key consumer goods) more costly. This would squeeze the budgets of most families, given America’s rising import dependency as its economy is post-industrialized and financialized. So Mr. Bernanke’s favored policy is to get banks lending again – not for the government to spend more on deficit spending on infrastructure, social services or other full employment projects. The government spending that Mr. Bernanke has endorsed is pure bailouts to the banks, insurance companies, real estate packagers and other Wall Street institutions so that they can support asset prices and thereby save the economy’s financial balance sheet, not its employment and living standards. More debt thus is not the problem, in Chairman Bernanke’s view. It is the solution. This is what makes his re-appointment so dangerous. Devaluation of the dollar FDR-style will make U.S. real estate, corporations and other assets cheaper to global investors. It thus will have the same “positive” effects (if you can call making homes and office buildings more costly to buyers a “positive” effect) as more credit – and without the debt service needing to be raked off from the economy. This policy is akin to the International Monetary Fund’s “stabilization” and austerity programs that have caused such havoc over the past few decades. It is the policy being prepared for imposition on the United States. This too is what makes Bernanke’s re-appointment so dangerous. The problem is a combination of Mr. Bernanke’s dangerous misreading of economic history, and the banker’s-eye perspective that underlies this view – which he now has been empowered to impose from his perch as central planner at the Federal Reserve Board. Pres. Obama’s support for his reappointment suggests that the recent economic rhetoric heard from the White House is a faux populism. The President promises that this time, it will be different. The former Bush appointees – Geithner, Bernanke and the Goldman Sachs managers on loan to the Treasury – will be willing to stand up to Goldman Sachs and the other bankers. And this time the Clinton-era Rubinomics boys will not do to the U.S. economy what they did to the Soviet Union. With this stance, it is no wonder that the Obama Democrats are relinquishing the populist anti-Wall Street card to the Republicans! Mr. Bernanke misses the problem that debts need to be repaid – or at least carried. This debt service deflates the non-financial “real” economy. But the Fed’s analysis stops just before the crash. It is a “good news” theory limited to the happy time while the bubble is expanding and homeowners borrow more and more from the banks to buy houses (or more accurately, their land sites) that are rising in price. This was the Greenspan-Bernanke bubble in a nutshell. We need not look as far back as the Great Depression. Japan since 1990 is a good example. Its land prices declined every quarter for over 15 years after its bubble burst. The Bank of Japan did what the Federal Reserve is doing now: It lowered lending rates to banks below 1%. Banks “earned their way out of debt” by lending to global speculators who used the yen loans to convert into foreign currency and buy higher-yielding assets abroad – capped by Icelandic government bonds paying 15%, and pocketing the arbitrage difference. This steady conversion of speculative money out of yen into foreign currency held down Japan’s exchange rate, helping its exporters. Likewise today, the Fed’s low-interest policy leads U.S. banks to borrow from it and lend to arbitrageurs buying higher-yielding bonds or other securities denominated in euros, sterling and other currencies. The foreign-exchange problem develops when these loans are paid back. In Japan’s case, when global financial markets turned down and Japanese interest rates began to rise in 2008, arbitrageurs decided to unwind their positions. To pay back the yen they had borrowed from Japanese banks, they sold euro- and dollar-denominated bonds and bought the Japanese currency. This forced up the yen’s exchange rate – eroding its export competitiveness and throwing its economy into turmoil. The long-ruling Liberal Democratic Party was voted out of power as unemployment spread. In the U.S. case today, Chairman Bernanke’s low interest-rate regime at the Fed has spurred a dollar-denominated carry trade estimated at $1.5 trillion. Speculators borrow low-interest dollars and buy high-interest foreign-currency bonds. This weakens the dollar’s exchange rate against foreign currencies (whose central banks are administering higher interest rates). The weakening dollar leads U.S. money managers to send more investment funds out of our economy to those promising stock market gains as well as a foreign-currency gain. The prospect of undoing this credit creation threatens to lock the United States into a low-interest trap. The problem is that if and when the Fed begins to raise interest rates (for instance, to slow the new bubble that Mr. Bernanke is trying to inflate), global speculators will repay their dollar debts. As the U.S. carry trade is unwound, the dollar will soar in price. This threatens to make Mr. Obama’s promise to double U.S. exports within five years seem an impossible dream. The prospect is for U.S. consumers to be hit by a triple whammy. They must pay higher prices for the goods they buy as the dollar declines, making imports more expensive. And the government will be spending less on the economy’s circular flow as a result of Pres. Obama’s three-year spending freeze to slow the budget deficits. Meanwhile, states and cities are raising taxes to balance their own budgets as tax receipts fall. Consumes and indeed the entire economy must run more deeply into debt simply to break even (or else see living standards eroded). To Mr. Bernanke, economic recovery requires resuscitating the Goldman Sachs squid that Matt Taibbi so artfully has described as being affixed to the face of humanity, duly protected by the Fed. The banks will lend more to keep the debt pyramid growing to enable consumers, businesses and local government to avoid contraction. All this will enrich the banks – as long as the debts can be paid. And if they can’t be paid, will the government bail them out all over again? Or will it “be different” this time around? Will our economy flounder with Mr. Bernanke’s reappointment as the rich get richer and the American family comes under increasing financial pressure as incomes drop while debts grow exponentially? Or will Americans get rich off the new bubble as the Fed re-inflates asset prices? Unfortunately, by “disaster” Sen. Kerry seems to mean losses for Wall Street. He shares with Chairman Bernanke the idea that gains in raising asset prices are good for the economy – for instance, by enabling pension funds to pay retirees and “build wealth” for America’s savers. While the Bush-Obama team hopes to reflate the economy, the $13 trillion bailout money they have spent trying to fuel the destructive bubble takes the form of trickle-down economics. It has not run up public debt in the Keynesian way, by government spending such as in the modest “Stimulus” package to increase employment and income. And it is not providing better public services. It was designed simply to inflate asset prices – or more accurately, to prevent their decline. This is what re-appointment of the Fed Chairman signifies. It means a policy intended to raise the price of housing on credit, with a corresponding rise in consumer income paid to bankers as mortgage debt service. Meanwhile, rising stock and bond prices will increase the price of buying a retirement income. A higher stock price means a lower dividend yield. The same is true for bonds. Flooding the capital markets with credit to bid up asset prices thus holds down the yield of the assets of pension funds, pushing them into deficit. This enables corporate managers to threaten bankruptcy of their pension plans or entire companies, General Motors-style, if labor unions do not renegotiate their pension contracts downward. This “frees” yet more money for financial managers to pay creditors at the top of the economic pyramid. How does one overcome this financial polarization? The seemingly obvious solution is to select Fed and Treasury administrators from outside the ranks of ideologues supported by – indeed, applauded by – Wall Street. Creation of a Consumer Financial Products Agency, for instance, would be largely meaningless if a deregulator such as Mr. Bernanke were to run it. But that is precisely what he is asking to do in testifying that his Federal Reserve should be the sole regulatory agency, nullifying the efforts of all others – just in case some state agency, some federal agency or some Congressional committee might move to protect consumers against fraudulent lending, extortionate fees and penalties and usurious interest rates. Mr. Bernanke’s fight against proposals for such regulatory agencies to protect consumers from predatory lending is thus a second reason not to re-appoint him. How can Mr. Obama campaign for his reappointment as Chairmanship of the Fed and at the same time endorse the consumer protection agency? Without dumping Bernanke and Geithner, it doesn’t seem to matter what the law says. The Democrats have learned from the Bush and Reagan administrations that all you have to do is appoint deregulators in key positions, and legal teeth are irrelevant. This brings up the third premise that defenders of Mr. Bernanke cite: the much vaunted independence of the Federal Reserve. This is supposed to be safeguarding democracy. But the Fed should be subject to representative democracy, not independent of it! It rightly should be part of the Treasury representing the national interest rather than that of Wall Street. This has emerged as a major problem within America’s two-party political system. Like the Republican team, the Obama administration also puts financial interests first, on the premise that wealth flows from its credit activities, the financial time frame tends to be short-run and economically corrosive. It supports growth in the debt overhead at the expense of the “real” economy, thereby taking an anti-labor, anti-consumer, anti-debtor policy stance. Why on earth should the most important sector of modern economies – finance – be independent from the electoral process? This is as bad as making the judiciary “independent,” which turns out to be a euphemism for seriously right-wing. Over and above the independence issue, to be sure, is the problem that the government itself if being taken over by the financial sector. The Treasury Secretary, Fed Chairman and other financial administrators are subject to Wall Street’s advice and consent first and foremost. Lobbying power makes it difficult to defend the public interest, as we have seen from the tenure of Mr. Paulson and Mr. Geithner. I don’t believe Mr. Obama or the Democrats (to say nothing of the Republicans) is anywhere near rising to the occasion of solving this problem. One can only deplore Mr. Obama’s repetition of his endorsements. Allied to the “independence” issue is a fourth reason to reject Mr. Bernanke personally: the Fed’s secrecy from Congressional oversight, highlighted by its refusal to release the names of the recipients of tens of billions of Fed bailouts and cash-for-trash swaps. Now that the confirmation arguments against Mr. Bernanke’s reappointment have been rejected, what does it mean for the future? On the political front, his reappointment is being cited as yet another proof that the Democrats care more for bankers than for American families and employees. As a result, it will do what seemed unfathomable a year ago: enable GOP candidates to strike the pose of FDR-type saviors of the embattled middle class. No doubt another decade of abject GOP economic failure would simply make the corporate Democrats appear once again to be the alternative. And so it goes … unless we do something about it. The problem is not merely that Mr. Bernanke failed to do what the Fed’s charter directs it to do: promote employment in an environment of stable prices. The Republicans – and some Democrats – read out the litany of Bernanke abuses. The Fed could have raised interest rates to slow the bubble. It didn’t. It could have stopped wholesale mortgage fraud. It didn’t. It could have protected consumers by limiting credit card rates. It didn’t. For Bernanke, the current financial system (or more to the point, the debt overhead) is to be saved so that the redistribution of wealth upward will continue. The Congressional Research Service has calculated that from 1979 to 2003 the income from wealth (rent, dividends, interest and capital gains) for the top 1 percent of the population soared from 37.8% to 57.5%. This revenue has been expropriated from American employees pushed onto debt treadmills in the face of stagnating wages. Meanwhile, the government is permitting corporate tollbooth to be erected across our economy – and un-taxing this revenue so that it can be capitalized into financialized wealth paying only a 15% tax rate on capital gains. It pays these taxes not as these gains accrue, but and only when they realize them. And the tax does not even have to be paid if the sales proceeds of these assets is reinvested! Financial and fiscal policy thus reinforce each other in a way that polarizes the economy between the financial sector and the “real” economy. Behind these bad policies is a disturbing body of junk economics – one that, alas, is taught in most universities today. (Not at the University of Missouri at Kansas City, and a few others, to be sure.) Mr. Bernanke views money simply as part of a supply and demand equation between money and prices – and he refers here only to consumer prices, not the asset prices which the Fed failed to address. That is a big part of the Fed’s blind spot: Messrs. Greenspan and Bernanke imagined that its charter referred only to stabilizing consumer prices and wages – while asset prices – the cost of obtaining housing, an education or a retirement income – have soared as a result of debt leveraging. What Mr. Bernanke misses – along with his neoclassical colleagues – is that the money that is spent bidding up prices is also debt. This means that it leaves a debt legacy. When banks “provide credit” by writing loans, what they are selling is debt. The question their marketing departments ask is, how large is the market for debt? When I went to work for Chase Manhattan in 1967 as its balance-of-payments analyst, for example, I liaised with the marketing department to calculate how large the international debt market was – and how large a share of this market the bank could reasonably expect to get. The bank quantified the debt market by measuring how large a surplus borrowers could squeeze out over and above basic break-even needs. For personal loans, the analogy was how much could a wage earner afford to pay the bank after meeting basic essentials (rent, food, transportation, taxes, etc.). For the real estate department, how much net rental income could a landlord pay out, after meeting fuel and other operating costs and taxes? The anticipated surplus revenue was capitalized into a loan. From the marketing department’s vantage point, banks aimed at absorbing the entire surplus as debt service. Financial debt service is not spent on consumer goods. It is recycled into new loans, after paying dividends to stockholders and salaries and bonuses to its managers. Stockholders spend their money on buying other investments – more stocks and bonds. Managers buy trophies – yachts, trophy paintings, trophy cars, trophy apartments (whose main value is their location – the neighborhood where their land is situated), foreign travel and other luxury. None of this spending has much effect on the consumer price index, but it does affect asset prices. This idea is lacking in neoclassical and monetarist theory. Once “money” (that is, debt) is spent, it has an effect on prices via supply and demand, and that is that. There is no dynamic over time of debt or wealth. Ever since Marxism pushed classical political economy to its logical conclusion in the late 19th century, economic orthodoxy has been traumatized from dealing about wealth and debt. So balance-sheet relationships are missing from the academic economics curriculum. That is why I stopped teaching economics in 1972, until the UMKC developed an alternative curriculum to the University of Chicago monetarism by focusing on debt creation and the recognition that bank loans create deposits, inverting the usual “Austrian” and other individualistic parallel universe theories. I elaborate the logic in greater detail in “Saving, Asset-Price Inflation, and Debt-Induced Deflation,” in L. Randall Wray and Matthew Forstater, eds., Money, Financial Instability and Stabilization Policy (Edward Elgar, 2006):104-24. And I explain how the recent expansion of credit and easing of lending terms fueled the real estate bubble in “The New Road to Serfdom: An illustrated guide to the coming real estate collapse,” Harpers, Vol. 312 (No. 1872), May 2006):39-46. I explain the workings of these plans in greater detail in Super Imperialism: The Economic Strategy of American Empire (1972; new ed., 2002), “Trends that can’t go on forever, won’t: financial bubbles, trade and exchange rates,” in Eckhard Hein, Torsten Niechoj, Peter Spahn and Achim Truger (eds. ), Finance-led Capitalism? (Marburg: Metropolis-Verlag, 2008), and Trade, Development and Foreign Debt: A History of Theories of Polarization v. Convergence in the World Economy (1992, new ed. 2009).